Born 1978, New York, NY, USA. Lives in New York, NYIsca Greenfield-Sanders makes square-format landscape painting, often beach scenes, based on vintage 35mm color slides. Her interest in the still image as a stand-in for memory led her to develop a multistep process that combines photography, watercolor, and oil. She scans and manipulates the source image, creates a watercolor study, enlarges it to a square of thirty-five or sixty-three inches, and transfers it to a canvas using a pair grid that remains faintly visible. The final layer is painted with oils to create depth and allow evidence of the layering beneath. Drawing on her background in visual arts and mathematics, she creates her work in series, sometimes producing up to ten images from a single slide. Greenfield-Sanders’s choices often reveal the amateurish nature of her photographic sources. Beach Fade (2015) focuses on the disjointed poses (possibly borrowed from multiple slides) of a woman, a man, and a young boy, their discontent echoed in the bleached-out distortion of the underexposed photograph. The scene in West Coast (2015) appears to have been captured while the photographer was lying down – the horizon runs diagonal from the bottom left, with a group of figures on the right for balance. In Bathers (2016) the figures are formed by an economy of brushstrokes with very little detail, the grid a sieve that filters them out. Greenfield-Sanders’s works act as a parallel to memory – the original event loses important details in each iteration or “telling,” yet because photographs are perceived as uniquely authentic, the depiction seems unquestionably true. 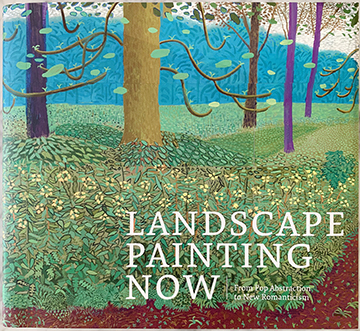 Landscape Painting Now | From Pop Abstraction to New Romanticism is Published by D.A.P. 2019. The book was edited by Todd Bradway, with essay by Barry Schwabsky, and contributions by Robert R. Shane, Louise Sørensen, and Susan A. Van Scoy.